Our trip to Japan certainly started out on the right foot. When we arrived at the Sydney Airport to check in for our flight we found out that Japan Airlines had overbooked economy class and they had no choice but to upgrade us to first class. We gleefully joined the Japanese businessmen in black suits at the luxurious front of the plane where we must have stuck out like throbbing thumbs in track pants and flip flops. That and the fact that a curious Katrina put her seat in the full 180 bed position as soon as the fasten seatbelt sign went off. In addition to the expected perks (read: champagne) we got bowing flight attendants, on demand udon or soba noodle soup, and a "Japanese style" lunch option that featured a beautiful display of a dozen or so colorful items including fish, duck, shrimp, tamago, soba, and miso soup to name a few. And the cheese and dessert tray that came down the aisle made us feel like we were at an elegant restaurant instead of thousands of feet in the air. We expected that our arrival in Tokyo would be a rude awakening. 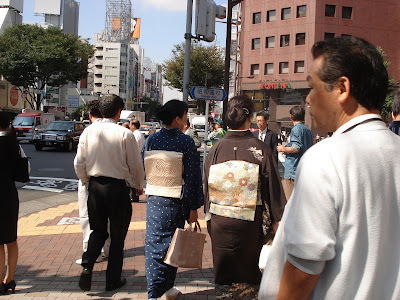 Crowds, Japanese characters, and chaos. It took us hours of wandering to find our first hotel in Moscow--and that was just the Cyrillic alphabet. Japan at first glance was, as we expected, different. However not enough to completely catch you off guard but in a more subtle, in the details sort of way that had us smiling from the get go. Finding our ac commodations this time was a breeze, especially with English translations on all the street signs. 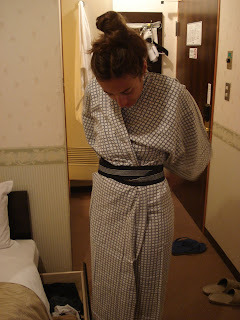 Oak Hotel was just lovely with slippers at the door and two robes laid out by a warm bed to welcome us to our room. It was completely adorable how everything was in miniature, particularly the half-length, half-width bathtub in a closet-like bathroom--even the tea kettle was tiny! Oak Hotel is a short walk from three different train/subway stations which makes it the perfect homebase for exploring Tokyo. And explore we did! We started out in Central Tokyo with a walk around the moated Imperial Palace, which is surrounded (at a distance) by the National Diet, Suprem e Court, National Theatre, museums, and the British Embassy. Civilians are not allowed in the palace and only permitted in a small fraction of the gardens. What we did get to see could more accurately be described as the "royal grounds" instead of "gardens"; there were not many flowers but many historic buildings, including three samurai guardhouses, and some lovely stonework and fish ponds. 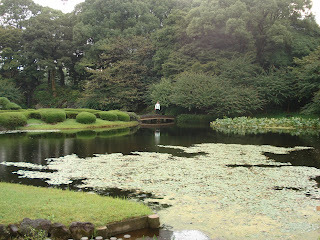 The quiet terrain of the Imperial Gardens is quite a contrast to the urban jungle of Shinjuku. We started with a free ride up to the observatory tower of the Municipal Government Building. Amidst the impressive skyscrapers Patrick spotted the Jingu Baseball Stadium not too far away; next thing you know we were sitting among Swallows fans with a game snack of edamame rooting on the home team against the visiting Tigers. Japanese baseball rules are exactly the same as American, but without much power behind the plate the game is played somewhat differently. Think small ball on steriods. Wait, that doesn't work. Think small ball on diet pills. The crowd was extremely lively, but not like we are used to at Fenway. Soccer-style, the fans of the visiting team were segregated to their own section and whoever's team was at bat was led in constant organized singing and cheering by an official leader. We were surprised to see and hear a lot of English mixed in with Japanese in the cheers and on the scoreboard. We were thrilled to catch a team shirt when their mascot pulled out the t-shirt gun--Patrick donned it immediately with the Swallows' motto, "Just play to win", in English across his chest. Oh, and one last difference. Instead of the seventh inning stretch there is "Lucky 7", an opportunity for the crowd to stand, sing, and wave their most dear of accessories- the umbrella. 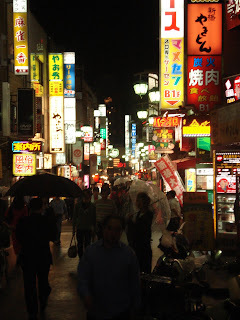 By the time we l eft the park it was dark--perfect for seeing the seedy Shinjuku all lit up in neon. We walked by shops, karaoke venues, clanging slot machine parlors, and hundreds of little restaurants before sitting down to a meal of sushi by conveyor belt. The counter had a simple setup: chopsticks, soy sauce, huge jars of pickled ginger, and hot water dispensers for filling up your tea at will. The hard part was deciding which delicious dish of sushi to snap up as it passed by. They use the color and shape of the empty plates to figure out how much to charge us at the end and we were shocked to find out that none of the items we'd selected had cost more than $2 USD. 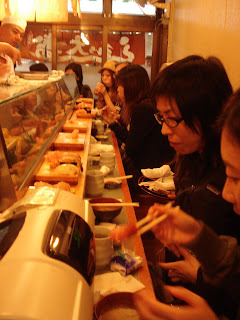 Conveyor belt sushi was fun, but our sushi experience the next morning blew it away. Tsukiji is the largest fish market in the world, and when we got there mid-morning it was filled with men in trucks and on scooters whizzing around the docks picking up the orders they had secured much earlier at auction. There is a smaller market aimed at the non-industrial customer steps away from the big rigs, and we immediately zeroed in on a tiny sushi restaurant with a huge line out the door. The windows were steamed up and an employee kept coming outside to yell Japanese at the hopeful customers, manually turn us around, and reorganize the line in a strange manner that made sense to no one but her. By the time we got in to sit down we'd figured out exactly how much sushi we could buy before maxing out at this cash-only establishment, which wasn't much, since it was pricey, too. At the counter, we were immediately given cups of green tea and a personal sushi chef who elegantly made each piece to order. And oh my gosh. Best. Sushi. Ever. The tuna glistened like a jewel on its little bed of rice and the freshwater eel delicately melted in our mouths like nothing we'd ever tasted. It's probably a good thing we hadn't come prepared with more cash, because no matter the amount we would have gone through it all. Living on noodles the rest of the time proved much more economical. 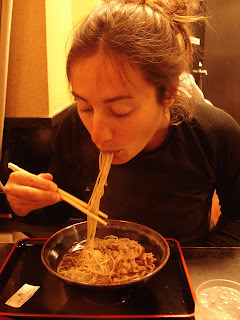 Noodle houses are ev erywhere, dishing out heaping bowls of udon or soba with meat, veggies, egg, fried fruits of the sea, and who knows what else. Every restaurant has pictures and/or plastic food models outside, making it very easy for us to point at what looked good (even if we couldn't identify all the components). Slurping is actually encouraged, which makes for an interesting soundtrack while you dine, and we actually got pretty good at it. Patrick coined the term "broth face" for the messy condition in which the slurping left our chins. Also, encouraged is finishing your dish by sipping directly from the bowl. So be sure to eschew the ladle next time you go to Wagamama. After Tsukiji we walked a few blocks to the Kabuki-za Theatre, one of the most famous places to see traditional kabuki. A full performance is four or five hours and tickets are expensive, but it's possible to purchase single act passes for around $7 USD each to watch from the fourth floor balcony. We got to see the first act and it was definitely something else. The costumes are incredible and the speech is highly stylized, with actors' voices sliding up and down the scale. We of course had no idea what was going on in the plot but deduced that it had something to do with a rivalry between warriors, the emperor judging a case, and a battle. Bottom line...someone had their head cut off and it was awesome. The audience seemed to be enjoying the show as they yelled out throughout the performance, often exclaiming the name of their favorite actor during one of his dances. Just another charming difference of a world so far away and different from the one we call home. View more pictures from Tokyo here. Thanks for the well written post. Not being a fan of raw fish your vivid description of the eel slices made me quiver a little bit ... perhaps because my son has a fat pet eel in his aquarium that appears to have just given birth too ... well whatever eels give birth to. Thank YOu for your information. After reading this blog i am excited to visit this country. I am hoping i will visit there very soon. Let me check the hotel booking on ECT. I'm drooling while reading your blog...Can't wait to try it myself. No need to speak Japanese--there was a picture menu and we just pointed at what we wanted. In general they love the visuals in Japan...lots of photo menus, plastic demo food in windows, etc. Bon appetit!